More and more you read how nuts are a good source of vitamins and nutrients. 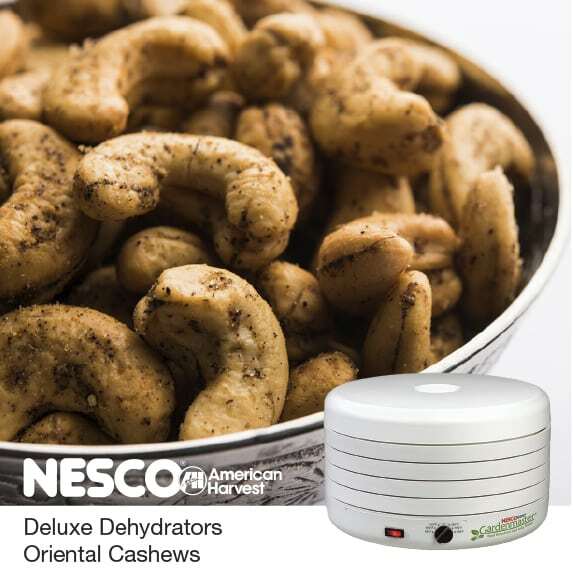 This recipe for Oriental Cashews made in your NESCO/American Harvest® Food Dehydrator is great tasting as well as a healthy snack. Also try these delicious cashews on a salad for a wonderful crunch. Let us know what you think. What are some of your favorite snacks you like to make in your NESCO/American Harvest® Food Dehydrator? Place nuts in a 9 inch square pan. Combine remaining ingredients and pour over nuts. Let sit at room temperature overnight. Drain liquid from nuts and place on Nesco®/American Harvest® Dehydrator tray. Dry at 145º F for 3 to 5 hours or until nuts are crunchy.